This is a wonderful memento from 2007 of great young musicians playing great music. Of course, it helps when the musicians are from Oberlin, and your professor of conducting is Robert Spano, but this is really a special concert by any measure. 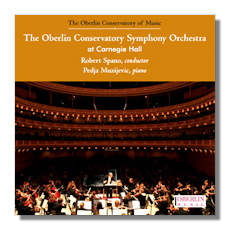 Perhaps more importantly, it demonstrates that Spano can get equal results at Oberlin as he can with his charges in Atlanta, and also shows him in repertoire that he hasn't otherwise recorded. That said, this is really about the fabulous orchestral forces at the Conservatory; they are superb. Jennifer Higdon is one of America's most prominent active composers, male or female, and her work blue cathedral is a wonderful example of her personal style. Robert Spano already made a fabulous recording if this piece for Telarc, on one of my favorite discs in my entire collection. This version is similar, a touch swifter, a touch thinner, and less well-played. It's not really fair to compare the Atlanta and Oberlin forces, but I really do like that the Oberlin players are just as willing to enter the sometimes mysterious and lush sound world of the composer. Telarc's fuller bass, as well as studio conditions, make that version preferable to the one here. That said, it's a great start. ArkivMusic does not currently list any Mozart in Robert Spano's discography. This is a shame, befxcause the conductor obviously can handle the Central European classics. The current state of the market, coupled with his catholic tastes, have not afforded him opportunity to show off this skill, so the Piano Concerto #25 comes as a pleasant surprise. This is a big, fat, Mozart concerto…if reduced forces were used, I can't hear it. But that's all to the good in my book, especially when well-played as here. Pedja Muzijevic plays with a lovely technique and a confidence that is welcome. The Oberlin players have just as much skill with Mozart as with Higdon, a testament to artistic versatility. The real treat is the Bartók, a marvelous account by any standard. First, the playing; it is exceptional. The Oberlin forces play with such élan that you really do feel like you're listening to a group of the world's finest; and you are, really. Bartók is not the easiest composer to pull off, and the composer placed enormous demands on the orchestra in his Concerto. Not a problem here. There is some absolutely astonishing first-desk playing, but everyone deserves credit for a very special account of great music. Then there's Spano; he knows exactly how to get what he wants from his young charges, and they respond with gusto. This must have been a joy to see, because it was certainly a joy to hear.